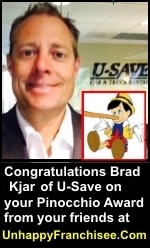 U-Save Franchise, Franchise Services of North America and U-Save Director of Operations Brad Kjar have been awarded an unprecedented 11-Inch Pinocchio Award for outstanding achievement in the field of honesty and ethics avoidance. (UnhappyFranchisee.Com) We are proud to announce the awarding of an unprecedented 11-Inch Pinocchio Award for the outstanding work of U-Save Director of Operations Brad Kjar. Mr. Kjar, as well as other members of the management team of Franchise Services of North America, Inc. were invited to address the complaints and concerns about their troubled company in an honest and open manner. Mr. Kjar communicated with the owner of Unhappy Franchisee website only after the post was published, and stated that he would like to respond but would have to get permission from the FSNA legal department. Most companies beset with lawsuits, franchise failures and accusations of dishonesty on a grand scale might think that circulating blatantly false and easily disproven statements about a brash website might be ill-advised. Mr. Kjar is correct. That’s exactly what our site is all about. And we appreciate all of the traffic and commenters that franchisors like U-Save and Franchise Services of North America Inc. continue to provide. One Pinocchio Inch Awarded. 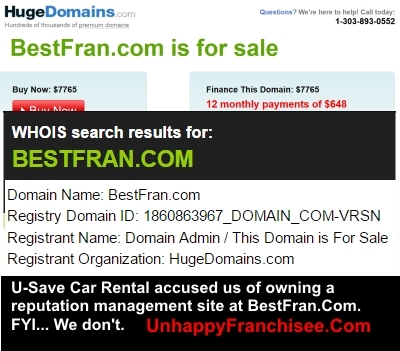 Mr. Kjar earns one Pinocchio inch for falsely stating that the owner of UnhappyFranchisee.Com owns BestFran.com (he doesn’t). One bonus Pinocchio inch goes to Director of Marketing Carrie Kelly and FSNA legal and management team for sending out a defamatory accusation to its franchisees and management without even bothering to check to see if the alleged website even exists. Now that is laziness at its most inspiring! We are delighted to award five bonus Pinocchio inches to FSNA and U-Save marketing for hiring TrustPilot, and to Brad Kjar for describing it in his email like it is something to be proud of. Bravo, U-Save! Partnering with TrustPilot will do wonders for advancing the image of U-Save and Franchise Services of North America Inc. as an honest and ethical corporation. TrustPilot is maligned across the Internet for allowing, encouraging and possibly generating fake positive reviews for companies and suppressing legitimate, negative reviews. TrustPilot gained international fame when a BBC reporter exposed their fake reviews, including one that used the picture and identity of a teenage girl named Ashley who had died in a car crash 7 years earlier. The fake reviewer had lifted her picture from her memorial site. The firm allows businesses to selectively display reviews about them, which may violate certain laws or regulations. Trustpilot featured fake reviews for Bizzyloans, one of which depicted a picture of a woman who had died. The fake reviewers often steal the identities of real people to falsely build up reviewed companies’ reputations. Watch the BBC investigation of TrustPilot, which includes an interview with Ashley’s grieving father. 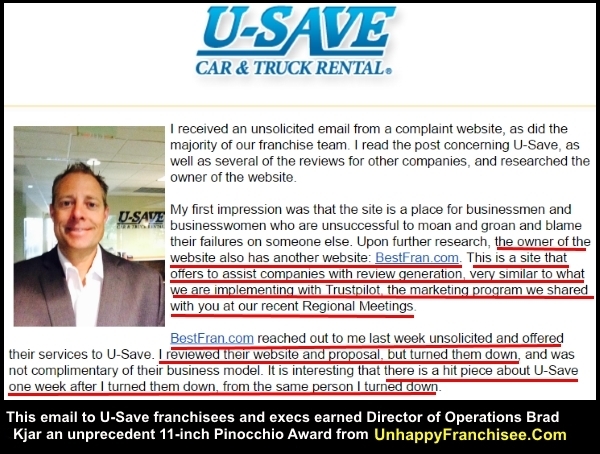 No doubt, Director of Operations Brad Kjar investigated TrustPilot with the same sophisticated research skills he used to UnhappyFranchisee.Com! Congratulations to Brad Kjar, and U-Save and Franchise Services North America management team on their unprecedented 11-Inch Pinocchio Award! Brad Kjar, Tom McDonnell, U-Save Holdings, Inc., Franchise Services of North America Inc. (FSNA): All individuals and companies discussed on this site are invited to provide clarifications, corrections, rebuttals or other statements for publication and linking from the original content. Email us at UnhappyFranchisee[at]gmail.com. You may also participate in the comment section of any page. ARE YOU A U-SAVE CAR & TRUCK RENTAL FRANCHISE OWNER OR EMPLOYEE?